WHAT: The Monster in My Pocket line spawned many promotional tie-ins during the 1990s, with figures being released in cereal boxes, fast food kids meals and as mail-away premiums. One of the more obscure promotional releases was a set of six Monster Wrestlers in My Pocket offered at fast food chain White Castle. The overall style of the figures is similar to the MIMP wrestlers that saw a standard release in the U.K. However, the sculpts for the White Castle set are original and slightly smaller. They're also not as detailed, both in sculpting work and color. Each of the six figures has only one color paint over a flesh plastic base. Bulldog: as the name implies, a dog guy. He's in red. 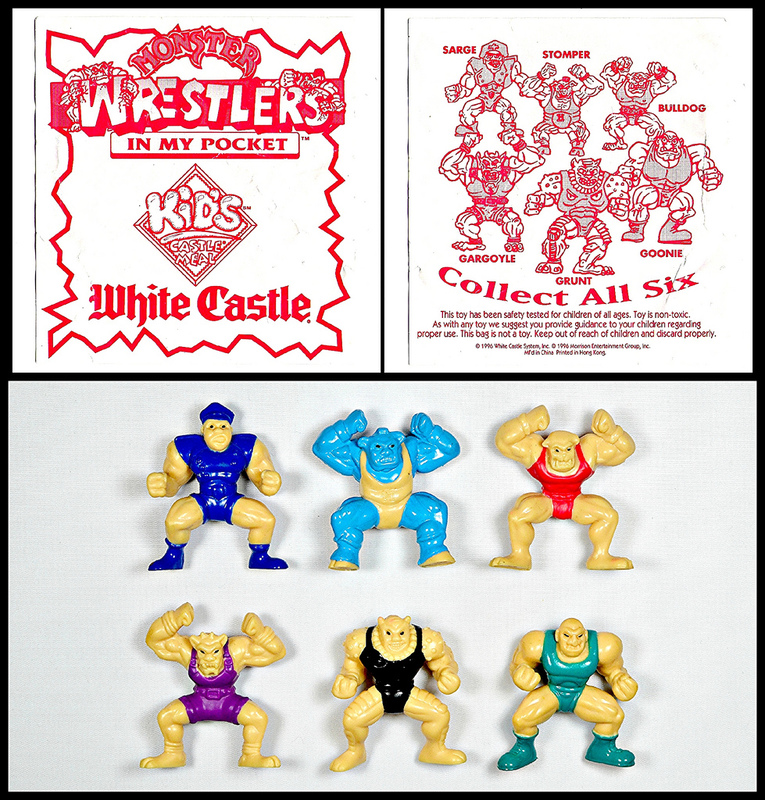 WHERE: While the standard Monster Wrestlers in My Pocket came out in the U.K., these particular figures were exclusive to the U.S, as White Castle is an American fast food chain. The figures were available as toy prizes in kids meals called "Castle Meals." WHO: Released by White Castle, with the Monster Wrestlers in My Pocket name/characters coming via Morrison Entertainment Group (as all releases under the MIMP franchise did). I have these, and if they weren't so "rare" I'd get rid of them. Monster Wrestlers are amongst my top five toylines ever, but these? They just don't "feel" right. If they were bootlegs I'd forgive them, maybe even find them charming, but with them being "official" and all that, they just seem lazy. I can't say I disagree with you. They're pretty lackluster. Still, an interesting item from the MIMP universe and worth hanging onto because of their obscurity. I got my set as a kid from WC and have kept them ever since. Being in the U.S., at the time I had no idea other MIMP wrestlers even existed. I see they're all cheaper models of Wrestlers that already exist in far better quality in the main MWIMP line...did these come first or the better quality versions of them? If the others came first, seems they could have just used those molds given these are... official. As I'm in the UK I'll likely never have these cheap imitations, 'shame cos I'd like to see a picture of them all next to their counterparts. I'm pretty sure these came after that standard ones and were copied from them. I'm not sure why they didn't just use the regular molds. I do have several of the UK wrestlers. I will check to see if I have any of the ones that correspond to these, and if so, take comparison photos.